H10 Pyramids Inn i Giza, Egypten : Boka nu! Your safety very important to us. 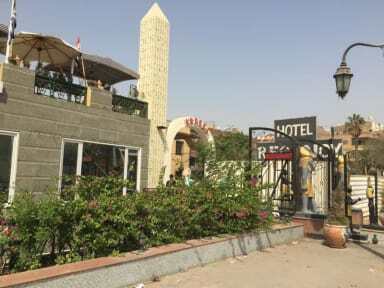 H10 Pyramids Inn is located in the Pyramids Gardens, which is a nice modern high class private compound security 24 hour. We have relaxing common room with Satellite TV just waiting for you. Also, we organize tours since I am free lancer. We do competitive prices to all kind of tours within your budget. H10 Pyramids Inn literally located a cross of the Giza Pyramids. 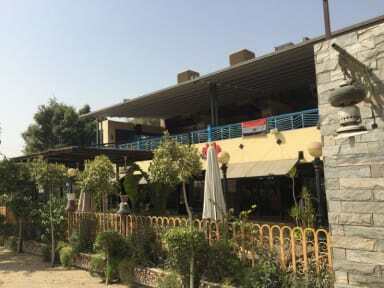 So, we will be famous for our guests as they can walk to Giza Pyramids and also there are two big hotels next door to me Le Meridian and Marriott “Mena House in the Past”. There are Banks next door. About Four different local restaurant around me named as follow Felfela, Andrea, Caviar, and Khristo. Also, we offer tours and transportation for our guests for good prices to have a great experience with us. You will have amazing private room with a view of the pyramids. If you are a single/couple or a group of peoples traveling together the whole room will be all yours. We have two main bedrooms that can be enough for 3 peoples and if, you are bigger group of more than three peoples we have additional rooms ready to host. Payment upon arrival by cash (USD, EUR, GBP), credit cards.